Recent research has shown that four-quadrant turbines are required to achieve maximum net energy production in a tidal barrage plant. These turbines can generate electricity in both flow directions and are capable of pumping. An innovative turbine concept is being reviewed in the course of the Eurostars research project Safe*Coast. This project proposes to install a turbine in a reversible cylinder in order to allow for fourquadrant operation. 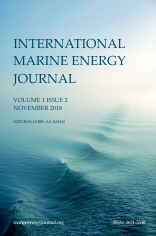 To evaluate the feasibility of the concept, the authors designed a compact low head axial tidal turbine with the aid of CFD simulations. This paper presents the methods used in the design and optimization process of the turbine. It also describes numerically obtained turbine characteristics, and cavitation limits. The most critical requirements of the turbine include high efficiency in turbine and pumping mode and safe cavitation properties. By computing steady state CFD simulations of the turbine stage, an extensive set of geometries was analyzed. The authors optimized the turbine performance by adjusting the meridional section, as well as runner blade and guide vane profiles and angles along with other related parameters. Transient simulations of the whole setup, including the inlet and draft tube geometries, were performed in order to study transient effects. The final design after optimization is a three bladed axial turbine with adjustable guide vanes and a rim generator. The turbine’s symmetrical inlet and outlet geometry and its relative compactness permit its integration in a reversible cylinder. The simulation results are very positive and indicate that all the relevant design criteria are satisfied. As a result, the project will continue into a new phase in which a model of the turbine will be built for physical testing in order to verify the results and to conduct further investigations.